I try to use components in novel ways. Do you? It is a good strategy as it results in unique designs. Check out Gloria Uhler's easy tutorial which features two hole jasper gemstone tiles. The flat conical beads (bead caps) she uses are typically placed at clasp ends which usually gathers together multi-strand necklaces. What she does is use those conical beads like spaces, sandwiching the gemstone tiles. The colored gemstones give the design a pop of color! The tutorial is suitable for beginners. She includes instructions on how to use clamshells. Wouldn't these look stunning with the new carrier beads. I've made several sets of the carrier bead and have bee scratching my head trying to figure out novel ways to combine them. 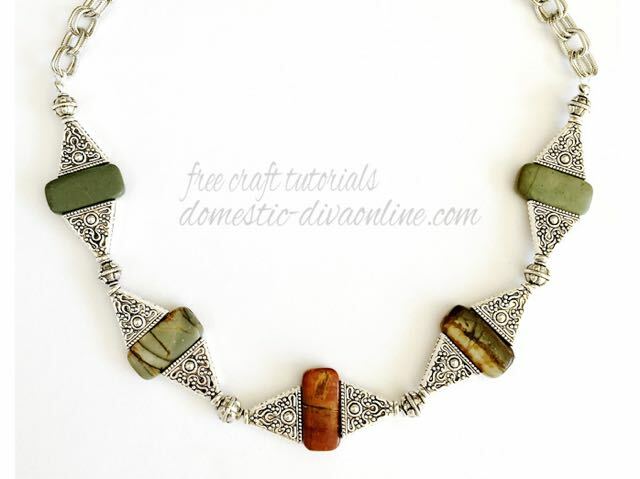 Carrier beads are perfect for this tutorial! Good thinking! I've got the 2-hole beads--now I just need to get the flat conical beads. Yay! Thank you! So pleased this inspired you! !